Freedom and the pursuit of happiness are the ideals that are celebrated each Independence Day. If you are a foodservice operator, you are certainly preparing your staff for a busy long weekend, complete with customized menu selections. 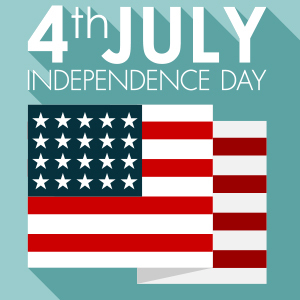 To help kick-off this much anticipated 4th of July holiday, Cambro is helping foodservice operators break free and declare their independence from 4 risky and inconvenient practices in their operation. Plastic Wrap & Aluminum Foil: Store food product in containers with tight fitting lids rather than unreliable covers to protect contents from spills and cross-contamination. Masking Tape for Labeling: Cover, label and date all food storage containers using dissolvable labels. Reduces the risk of harmful bacteria left behind from masking tape residue. Inconsistent Recipes: Use proper measuring tools to ensure that recipes taste great and that the portion of ingredients produces the proper consistency and density. Bare-hand-contact: Using Tongs or proper utensils will help act as a barrier in reducing the risk of cross-contamination. Independence from risky or improper habits doesn’t happen overnight. This week, commit to making small changes in your operation by allowing Cambro products to help you break free from time-consuming, unsafe practices in your operation. Tell us what inconvenient practices you’d like to declare your independence from this 4th of July. Reply to this post, enter on Facebook or reply to our Twitter handle! 20 Random Winners will be selected to win 4 on the 4th! 1. Post your reply to this post on the blog, on the corresponding Facebook post or reply to our Twitter handle. 2. Replies must be received by 5pm July 6th. 3. Winner announced on July 7th on Facebook as well as a reply to this post. 4. Each winner will receive 1 each: Square Container, Pack of StoreSafe labels, 1 Cup measuring Cup, 1 Tong. I’d love to be declare independence from plastic wrap and aluminum foil!!! Winner – please email your mailing address to cramos@cambro.com – thank you. bare hand contact is what i need independence from!!! I’d like to declare my independence from Plastic Wrap & Aluminum Foil so I can better avoid spillage and cross contamination. I’d like to declare my independence from Plastic Wrap & Aluminum Foil, so I can better avoid spillage and cross contamination.